Day and night, on highways (and certain side roads) across the province. Who are they and what are they doing? They’re our Road Area Managers and they pretty much do it all. BC is a BIG province, connected by a vast system of highways and side roads, and it’s our job to make sure those roads that belong to us are running smoothly and safely. To do that, we need to break down our province into three regions and 11 districts of responsibility. Each district (think Lower Mainland, Rocky Mountain, Skeena) has service areas within it and our Road Area Managers are the ministry boots on the ground in those areas, working to identify and resolve any local highways operations issues that might arise there. We start the day at the Saanich Area office, checking in with staff on issues and coordinating efforts for the field. Our first stop is a visit to the Mainroad South Island office and maintenance yard. Tina works closely with Mainroad to make sure they meet the terms and conditions of their contract. She creates audit plans to assess their compliance and recommends adjustments where needed to make sure the needs and priorities of area roads mesh with other ministry projects, programs and needs. 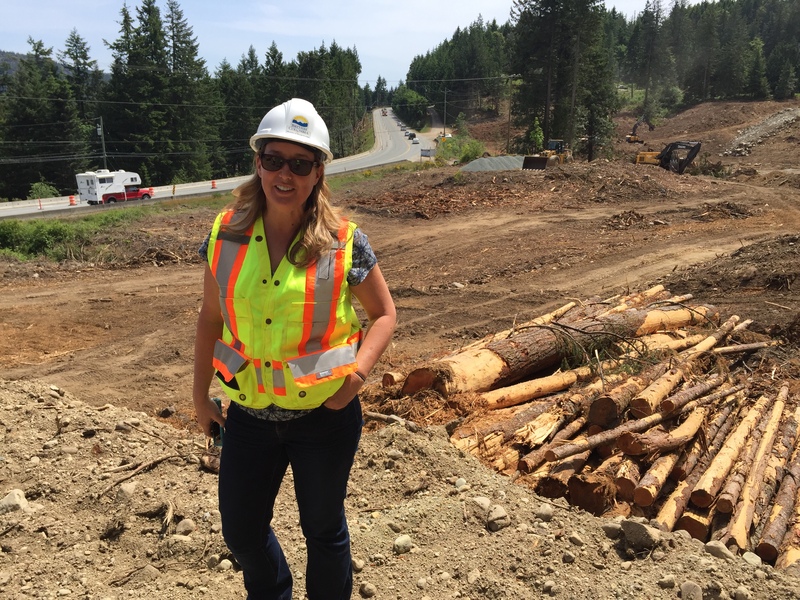 We headed north along the Malahat, passing through the site of the current safety improvement project underway there. Tina explained that while there is a project manager dedicated to the site, it’s the road area manager’s job to approve and monitor traffic management plans for all projects within their area to make sure the safety and convenience of the travelling public are considered. 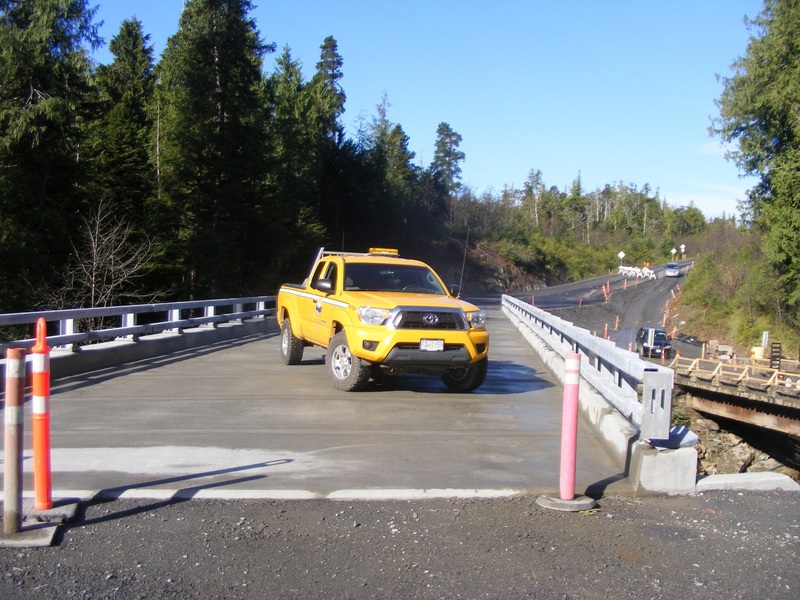 The headquarters and primary works yard for Mainroad South Island Contracting is located in Langford with supporting works yards in North Duncan, Sooke, Cobble Hill, and the Gulf Islands of Galiano, Mayne, Pender, Salt Spring, Thetis, and Saturna. We stopped in at a private construction site to following up on a concern over compliance issues for heavy truck and trailer traffic moving between work sites on side roads and highways. Tina had requested a wheel wash be installed to keep dirt and debris from tracking onto the highway and she wanted to follow up and see how it was progressing. From there, we headed off to visit a small piece of land owned by the ministry (also called a right of way), located alongside a busy highway. Tina had received a report from someone in the area that there was a homeless man sleeping in a pump house on the land and she had been working hard to try to find him a new place to call home. The pump house was unoccupied when we got to it, leaving her to feel hopeful that he might have had some success in finding a place. She made a note to follow up again, just to be sure. Tina wanted to touch base with a foreman from Mainroad in the area, so we headed to the office at his office at the ministry gravel pit. She chatted with him about a paving project underway in the area to get a sense of how it was going and see if there had been any feedback in the local community about it. They compared notes on a number of other local issues at the same time, determining the best course of action them. Tina returned a call from a homeowner in her area, asking to visit his property to discuss drainage and a ministry culvert at the property line. We visited the site and chatted with him about his options. Tina mentioned later that many folks think that culverts along road ways are public property and use them to drain water from their yard when there is no storm water system in the community. She explained that culverts alongside roadways are only meant to hold water running off the roadway and that added capacity from homeowners can overwhelm them. Homeowners are actually supposed to place a drainage field on their property to prevent the overflow of water from their property into roadway ditches and culverts. Next on our to do list was a visit to a local elementary school drop off zone to get a better understanding of recent issues and concerns in a local school district. Tina made some notes for follow up with the school district and concerned community members. In between these site visits and consultations, Tina took a number of calls; each asking her for insight on the ministry’s stance on other issues affecting her area. She took each call with care and consideration, making sure everyone was happy and taken care of. If she couldn’t get them an answer, she made notes to follow up when she did. Representing the ministry at public meetings and on local working groups and committees. Meeting with local MLAs, provincial and federal governments, BC RCMP and school districts as well as the general public to discuss concerns. Working with utilities companies (who often use transportation corridors for their services). Researching and responding to First Nations concerns or queries, including consulting on archeological and traditional use impacts, and treaty negotiations. Providing operational advice to development approvals staff on the impact of development, rezoning and other works to highway infrastructure. Monitoring traffic and road conditions in response to accidents or severe weather and approve and oversee road closures and post travel advisories if required. Responding to any unusual events or emergencies as a result of accidents, dangerous goods spills, landslides, rock-falls, avalanches, earthquakes, flooding, fires, etc. to keep the travelling public and existing infrastructure safe. Managing small projects to improve infrastructure and resolve stakeholder issues that don’t fall into our larger project delivery programs. Do you have any questions about this or anything other work the BC Ministry of Transportation and Infrastructure does? Let us know in the comments below. 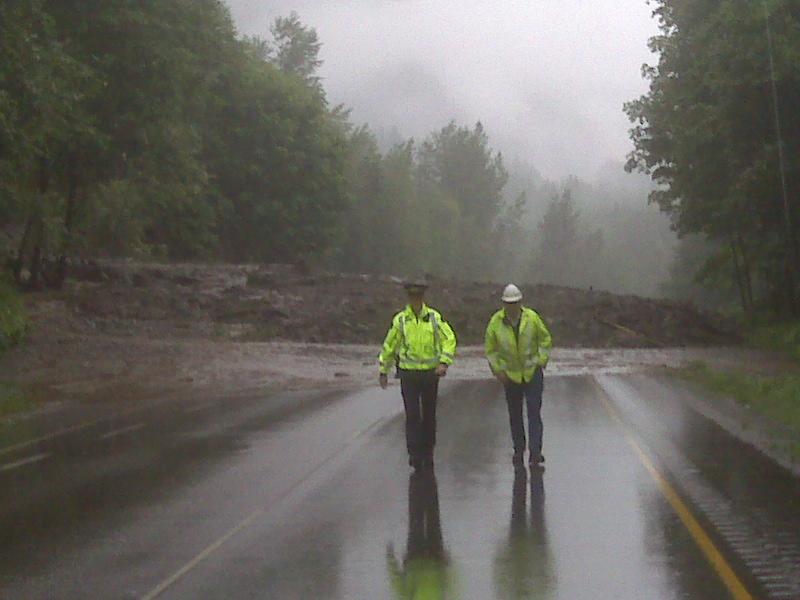 Road Area Managers are often first on scene for local emergency situations. Many of the communities on Southern Vancouver Island between Greater Victoria and Nanaimo (including the southern Gulf Islands) are un-incorporated, which means that they don’t have a local municipal government. Without a formal municipal structure in place, the care and maintenance of local side roads falls under the jurisdiction of the Ministry of Transportation and Infrastructure. There are more than a thousand side roads north of Victoria and south of Duncan. That’s a lot of roads, and a lot of work for our road area manager and maintenance contractor to maintain! Now you know. Thanks for your interest in a career with the Ministry of Transportation and Infrastructure. To apply on a job, you need to create a profile and add your resume to the Recruitment Management System. I think it’s time to get a new road contractor to look after the roads. It seems like the road Forman of Shawnigan Lake does not have a clue or does not care how to look after the roads. There happens to be a new fire station in Shawnigan Lake. You would think it is an essential service for the community! Tina Rogers says it is on a “D” road. The road classification was done at least fifteen years ago. It should be time to revisit the classification scale and get with times. The road care is pathetic!! Good piece. Great insight provided. But you skipped the bit where the Bridge Area Manager tells the Road Area Manager to get that dirty truck off their gorgeous spanking new bridge. Hahaha Grainger – thanks for the tip! We have area and operations managers in each service area to monitor the maintenance contractor in their specific service area. Just wanting to clarify – do you want to know how many ministry staff manage these areas or how many managers the maintenance contractors have on staff?